This book is written as a compilation of the history of Coastal Alabama with a detailed history of Baldwin County and Mobile County and their municipalities. Vintage photos are used to illustrate the occurrences that depict the economic history of Coastal Alabama. It is intended to enhance the understanding and appreciation of the rich history of Coastal Alabama and to preserve and perpetuate its history. People who love history will enjoy this book, especially those that love Coastal Alabama. It can be used as an educational resource on the history of Coastal Alabama. This book can serve as a guide to Historical Tourism in Coastal Alabama. People who vacation in Coastal Alabama will find this book helpful in choosing varying activities for their time in Baldwin and Mobile Counties. It all begins with a history of Mobile Bay. The geographical features of Coastal Alabama and how they shaped its economic history is the basic theme of this book. The developmental history includes the social development and transportation development in Coastal Alabama. There is information about the many historic structures and the Port of Mobile. A general description of Coastal Alabama is provided. Current economic activity is presented from the perspective of its historical development through the years in Coastal Alabama. Books, articles, websites, and other literature used during data collection for this book are listed for more detailed data. The contents for this book began from efforts to document what Coastal Alabama offered retirees. History of an area is becoming increasingly important and useful in the decision of where to live. Historical knowledge of attractions in an area can make visiting those attractions more satisfying. 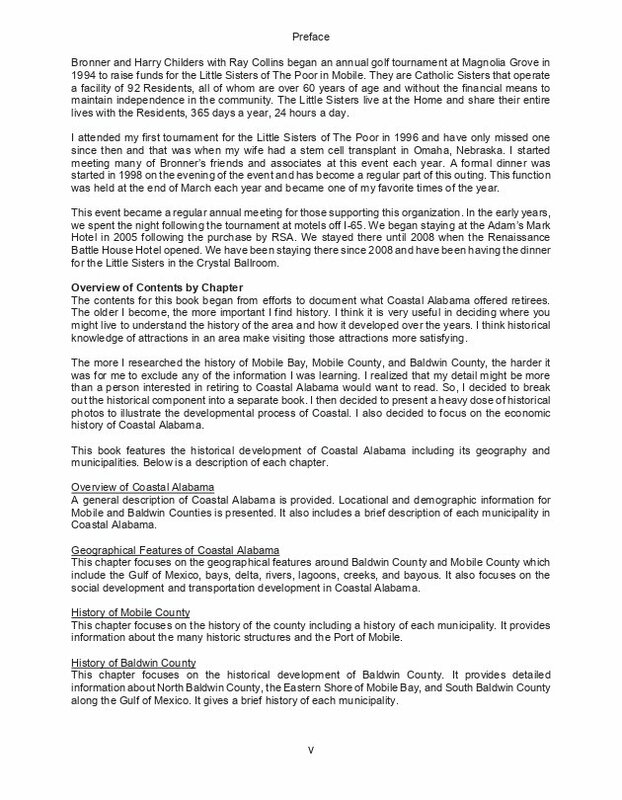 This book features the historical development of Coastal Alabama including its geography and municipalities. Below is the Table of Contents. 1. 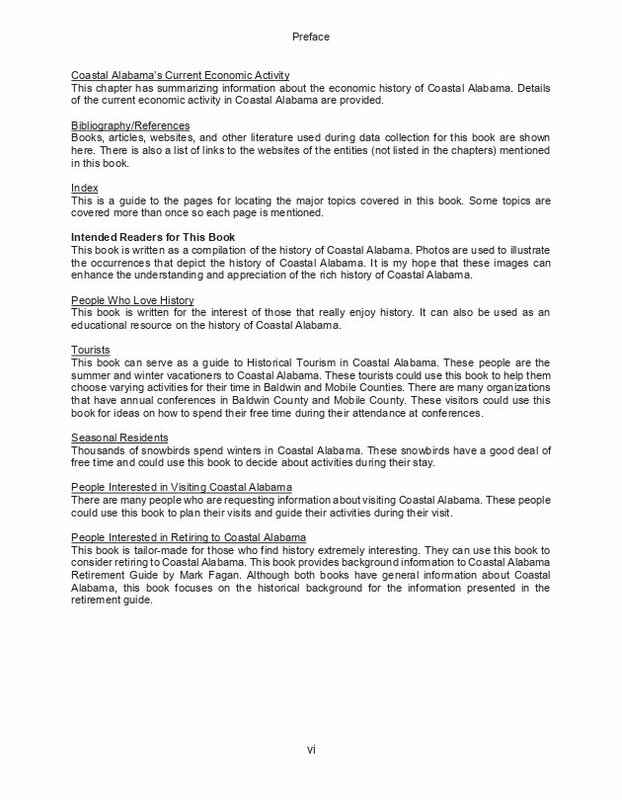 Introduction to Coastal Alabama. This is an overview of the location and demographic information and includes a description of each municipality. 2. Coastal Alabama’s Geographical Features. These include the Gulf of Mexico, bays, delta, rivers, lagoons, creeks, and bayous. It also focuses on the social development and transportation development in Coastal Alabama. 3. History of Mobile County. This includes a history of each municipality, many historic structures, the Mobile River, and the Port of Mobile. 4. History of Baldwin County. This covers the historical development of Baldwin County with detailed information about North Baldwin County, the Eastern Shore of Mobile Bay, and South Baldwin County along with a history of each municipality. 5. Coastal Alabama’s Current Economic Conditions. This presents Current Economic Activity, the economic history, and details of the main industries. This book is written for the interest of those that really enjoy history. It can also be used as an educational resource on the history of Coastal Alabama. It can serve as a guide to Historical Tourism in Coastal Alabama for vacationers, seasonal residents, and current residents. It can be used to help choose varying activities for their time in Baldwin and Mobile Counties. This book is tailor-made for retired people in Coastal Alabama who find history extremely interesting. It can also be used to consider retiring to Coastal Alabama. 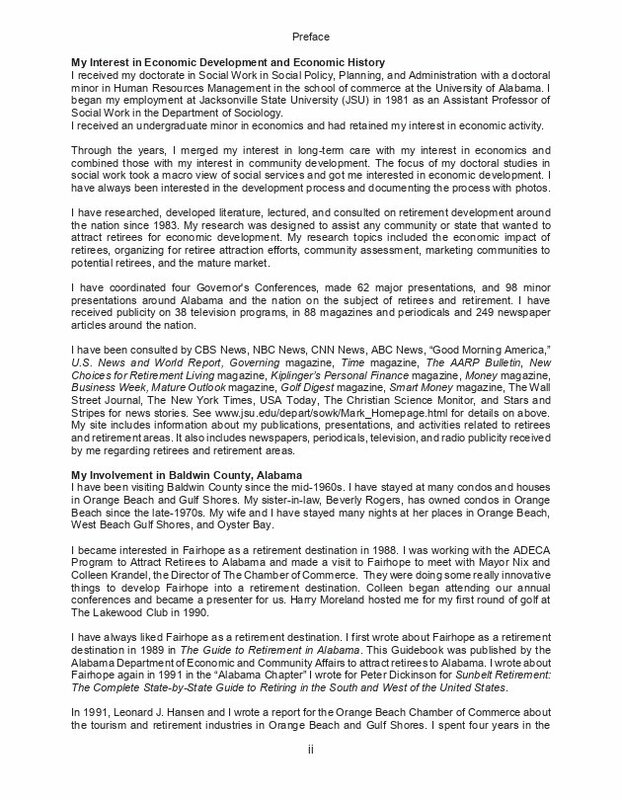 This book provides background information to Coastal Alabama Retirement Guide by Mark Fagan. Although both books have general information about Coastal Alabama, this book focuses on the historical background for the information presented in the retirement guide. Mark Fagan earned his doctorate in Social Policy, Planning, and Administration at The University of Alabama in 1981. He is Department Head Emeritus for the Department of Sociology and Social Work at Jacksonville State University in Alabama where he taught from 1981-2014. He has researched retiree migration and retirement communities for 35 years. Most of his 134 publications, media articles, and technical writings along with his hundreds of lectures and presentations around the nation since 1981 have focused on the economic impact of retirees and retirement communities. Click here for details on Fagan's publications, presentations, and publicity received. 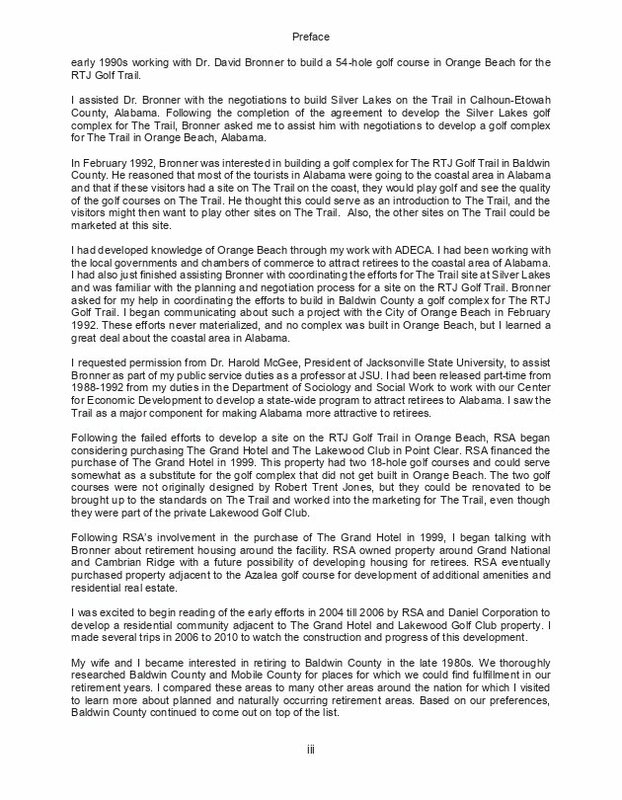 He is the author of Attracting Retirees for Economic Development; Retirement Development: A How-To Guidebook; The Robert Trent Jones Golf Trail: Its History and Economic Impact with a Foreword by David G. Bronner; Coastal Alabama Retirement Guide, and Alabama's Public Pension Fund Growth and Economic Expansion Since 1973. He has worked on economic development projects in Alabama since 1988. Click here for information on Fagan's other books along with photos and videos. He has received publicity on 38 television programs, in 88 magazines and periodicals and 249 newspaper articles around the nation. He has been consulted by or appeared in the The Golf Channel, CBS News, NBC News, CNN News, ABC News, "Good Morning America," U.S. News and World Report, Governing, Time, The AARP Bulletin, New Choices for Retirement Living, Money, Mature Outlook, Kiplinger's Personal Finance, Business Week, Golf Digest, Smart Money, The Wall Street Journal, The New York Times, USA Today, The Washington Post, The Christian Science Monitor, Stars and Stripes, and National Public Radio. He received an undergraduate minor in economics. He developed an interest in long-term care for active and inactive retirees. He gained knowledge of what economic impact these retirees had on communities. Through the years, he merged these interests and focused them on economic development activity for rural areas needing community development. He began analyzing communities and comparing their assets with the amenities attracting retirees. In 1983, he began researching and developing literature on the economic impact of retirees on communities. His research was designed to assist any community or state that wanted to attract retirees for economic development. His research topics included the economic impact of retirees, organizing for retiree attraction efforts, community assessment, marketing communities to potential retirees, and the mature market. He also began writing about community efforts to develop amenities for retirees as a form of economic development. He followed these activities with lectures, presentations, consulting, and program development around Alabama and the nation. His interest in retirement development in Alabama and his efforts to establish the first statewide program in the nation to attract retirees for economic development led him to Coastal Alabama. Coastal Alabama had a history of attracting tourists and retirees. 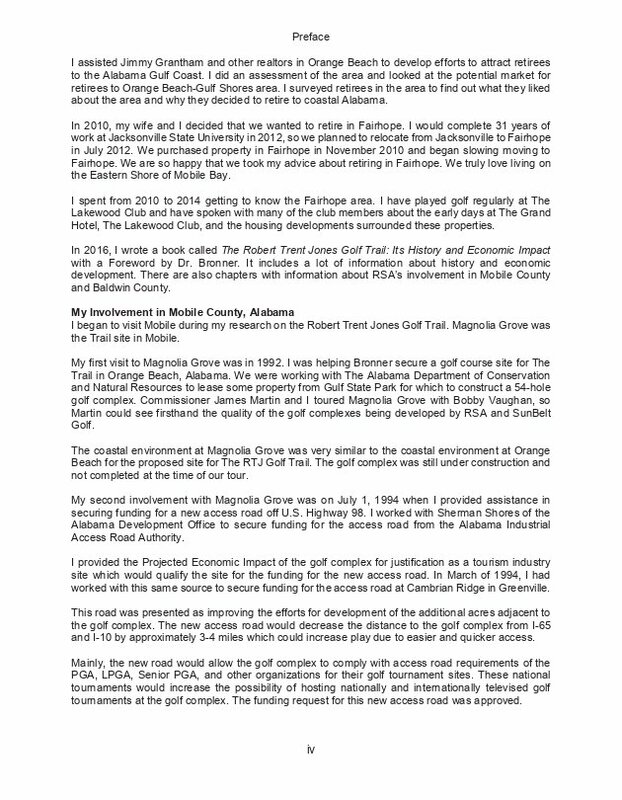 His efforts also got him involved with the conception and development of the Robert Trent Jones Golf Trail in Alabama. These activities sharpened his interest in economic history, economic impacts and projected economic impacts. His professional activities have focused on the tourism and retirement industries in Baldwin County and Mobile County. He has extensively researched and followed the redevelopment of downtown Mobile by The Retirement Systems of Alabama since the early 2000s. He has focused many of his efforts on tourism and retirement on The Eastern Shore of Mobile Bay. All of Fagan's research and involvement in Coastal Alabama increased his interest in economic development and economic history. This interest sustained his efforts to thoroughly research the economic history of Coastal Alabama. He has been visiting Baldwin County since the mid-1960s. He has lived in Coastal Alabama since 2012.